A Cost of Living Allowance (COLA) is a salary supplement paid to employees to cover differences in the cost of living, particularly as a result of an international assignment. The amount of COLA should enable an expatriate to be able to purchase the same basket of goods and services in the host location as they could in their home country. The basis for calculating a COLA is the Cost of Living Index (COLI) which indexes the costs of the same basket of goods and services in different geographic locations. COLA is a simple accurate method of measuring fluctuating salary purchasing power and ensuring parity. Each basket category does not count equally and are weighted in the final calculation based on expatriate spending patterns. In order to calculate an accurate cost of living index for a specific individual the basket items that are not relevant to the individual should be excluded from the calculation. For example if education and housing is provided by the employer these basket categories would be excluded from the cost of living index calculation. This increases the accuracy of the cost of living index and makes it possible for each individual to have their own customized cost of living index based on their specific arrangements rather than using an overall “generic” index which is likely to contains costs that are not relevant to the individual. When moving to a higher cost of living host city, the index will be greater than 1 (positive). When moving to a lower cost of living host city the index will be less than 1 (negative). Where the index is negative it means that in real terms the cost of living in the host city is lower than the home city. This means that if the negative index where to be applied to the employee’s salary, they would actually be paid proportionately less spendable salary in the host city. It is important to note that the majority of organizations do not apply a negative cost of living index because it makes it difficult to persuade an employee to take up an assignment as they tend to see it as a reduction in salary. The overall difference in cost of living moving from Perth and London is +28.06%. In this case the cost of living index is positive and would be applied as it is. The overall difference in cost of living moving from London Mumbai is -30.53%. In this case the cost of living index is negative and would not be applied. Differences in cost of living only impact the portion of the salary that is spendable in the host country. Items in the home country such as retirement funding, medical insurance and other home based costs are not impacted by the cost of living in the host country. To determine the Net Spendable Salary establish what amount / portion of the current salary (in home currency) is spent in maintaining the employee’s current standard of living / lifestyle. 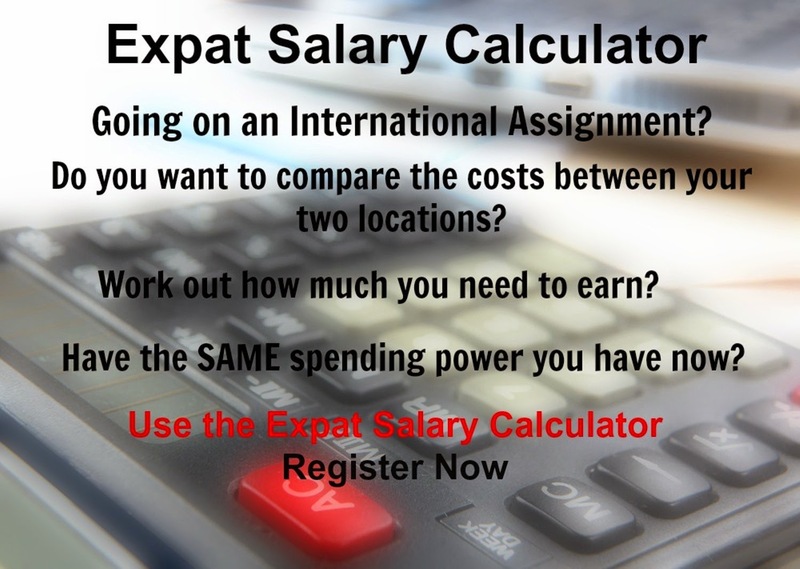 What will the expatriate need to spend their salary on in the host country? For example will accommodation be provided or will the employee pay rent, will healthcare be provided etc. Deduct all items that are either provided in kind or are spendable in the home country. Deduct the hypothetical amount of tax, social contributions and any other statutory deductions applicable in the home country from the Spendable Salary. What is left is the Net Spendable Salary. Based on all the above factors a person would require a Cost of Living Allowance of £13,379.44 (GBP), in addition to their current salary of 100,000.00 Australian Dollar (AUD) to compensate for relocating from Perth to London. This Cost of Living Allowance compensates for the overall cost of living difference of +28.06% and the relative difference in hardship of 0%. Note: Because the Cost of Living Index is negative it is not applied. Based on all the above factors a person would require a Cost of Living Allowance of 363,340.32 (INR ), in addition to their current salary of £18,000.00 British Pound (GBP ) to compensate for relocating from London to Mumbai. This Cost of Living Allowance compensates for the overall cost of living difference of [-30.53%] and the relative difference in hardship of 30%. The COLA is paid as a salary supplement (i.e. as an additional allowance) net of tax in the host country. If the COLA is a taxable allowance in the host country it should be grossed up in order that the full amount of calculated COLA is paid net of tax given that the basis of the calculation is Net Spendable Salary. The COLA is often accompanied by other allowances and benefits such as flights home, relocation / settling in allowance, and furnishing allowance. Significant changes in the exchange rate can make a considerable difference in the COLA calculation. In 2008 some of the major global exchange rates changed by as much as 30-40%. The cost of living index reflects the changes caused by inflation and exchange rates. In the short-term there may be disequilibrium between inflation and the exchange rate (the one pushes the other), however over time the cost of living index provides the most accurate view of the cost of living. It is important to remind expatriates that when the cost of living difference is negative, and the negative value has not been applied, they have higher purchasing power in the host country than they would at home. Where a negative cost of living index has not been applied (our recommended approach), and a change in the exchange rate indicates an upward adjustment in COLA may be required, it is recommended that the COLA should not be adjusted upward until the cost of living index becomes positive i.e. the cost of living reflects that there is a “real” increase in cost of living between home and host countries. This may mean that their would be no increase in the COLA as a result of exchange rate fluctuations for some considerable time. During this time the employee’s purchasing power decreases. But it is important to remember that until the cost of living difference becomes positive, the individual will still have a higher purchasing power than they do in their home country. It is advisable to stipulate a currency protection rule, rather than reacting to every fluctuation in the exchange rate. For example the rule may state that COLA will be reviewed if exchange rates or local inflation move by more than +10% during a year. It is important to keep in mind that the prices of goods and services are unlikely to drop in local currency. This would only occur in a period of deflation (negative inflation). Therefore the currency protection rule would normally make provision for upward adjustments in COLA and not downward adjustments during an employee’s assignment. Downward adjustments to an existing COLA due to exchange rate fluctuations without a corresponding drop in the prices of local goods and services puts immense pressure on an employee’s host currency budget commitments and can lead to the employee experiencing financial difficulty. Using an independent service provider provides an independent, objective basis for determining an employee’s COLA. We recommend therefore that a COLA is calculated by applying the specific (customized) cost of living index to the net spendable salary at the beginning of the assignment and monitoring exchange rate fluctuations thereafter in addition to the annual salary review.